The Margaret Taylor First Spouse Gold Coin in proof condition marks the thirteenth coin available in the First Spouse series from the US Mint. The Mint indicated an availability date of December 3, 2009 for the coin. Margaret grew up in a wealthy family and was expected to live an easy life. While this may have been the case in her childhood, it was not the path she chose as an adult. While visiting her sister in Kentucky, she met a young Army lieutenant (and future President of the United States) named Zachary Taylor. The two wed, and Margaret started the life of a career officer's wife.Not content to live in comfort without her husband, Margaret traveled with Zachary to almost every posting he was assigned to. She also insisted on as normal a household as she could muster, even if it was in a tent. As Zachary rose through the ranks, Margaret continued to be the consummate army wife and was known to provide aid and comfort to wounded soldiers after a battle as well as counsel grieving wives when their husbands were stationed away from them. When Zachary was elected President of the United States, Margaret was not in favor of it. She had hoped for a life of quiet retirement for the two, but once again, she rose to the occasion and joined her husband in D.C. to set up the household. The ceremonial functions she left to her daughter, but Margaret took control of the rest of the household, including looking after the health of Zachary. 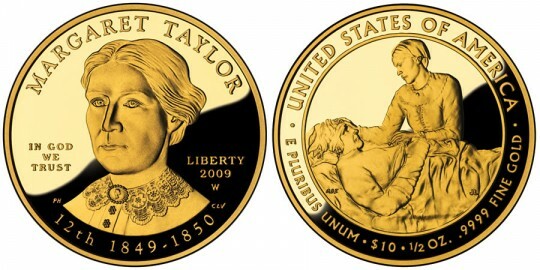 The Margaret Taylor coin is also available in an uncirculated version. A portrait of Margaret is featured on the obverse of her coin, designed by United States Mint Sculptor-Engraver Phebe Hemphill and sculpted by Sculptor-Engraver Charles L. Vickers. Also inscribed are the words "MARGARET TAYLOR ", "IN GOD WE TRUST", "LIBERTY", "2009", "12th 1849-1850", and the mintmark "W". The reverse was designed by Artistic Infusion Program Associate Designer Mary Beth Zeitz and sculpted by Sculptor-Engraver Jim Licaretz and shows Margaret giving comfort to a wounded soldier during the Seminole War. Included as well are the words "UNITED STATES OF AMERICA", "E PLURIBUS UNUM", "$10", "1/2 OZ. ", and ".9999 PURE GOLD".